Founded in the Isle of Man and established in 1994, they were the first developer to create an online casino as we know them today. Since the initial conception Microgaming have now over 850 to play UK video slots here under their umbrella, featuring both a range of games inspired by pop culture and characters unique to the brand. Made to be played, having of the largest portfolios in the industry is not where Microgaming take their pride, rather their pride comes from having some of the most creative and imaginative titles to be released within the genre – this developer does not skip quality for quantity. You can try their creations and find new slot games here. 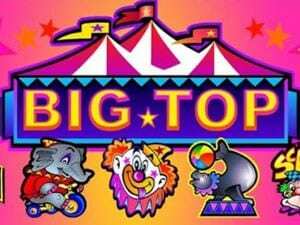 Powered by Microgaming and fresh to Wizardslots, the 2010 release of Big Top holds a simplistic 5-reels and 9-paylines machine filled with a range of circus-themed symbols. Despite this machine not containing Microgaming’s signature number of bonus levels the traditional pay-out method of triggering matches will still provide a staggering 96.94% RTP (return to player). Before playing, it's recommended to read more from our list games with best RTPs! Big Top is the perfect game for low-stake players, with a maximum of 5 credits for all 9 paylines the highest round possible comes in at 45 coins, alternatively, players can also wager a more budget-friendly amount of 0.25 coins for 9 paylines or even choose to bet on a single pay line. Before beginning the game, players have the choice to access Expert mode. Expert Modes primary purpose is to enable to option for Auto-Play, a feature that permits players to select a specific number of spins to be played automatically – giving players the chance to sit back, relax and watch the reels go around. Because this game has a rather traditional format, a lot of the additional appeal comes from the bright and welcoming illustrative style, setting Big Top apart from its direct competition. These icons include Elephants riding bikes, Seals performing, Lions, Clowns, Monkeys and even the Ringmaster. To further bulk out this machine there is also an introduction of traditional playing cards ranging from 10 to Ace. To win the highest possible amount from a single spin player should aim to match the games logo, enough matches will earn you a maximum of 5,000 coins. The next in the pay-table is the Lion for a 600-coin max, closely followed by the Clown at 500 max with the final high payment coming from the Elephant at 300 max. The lowest paying symbols throughout the game are the playing cards, but despite their lower payout they are matched more commonly throughout so could become a constant top up for your casino fund. In true Microgaming fashion, Big Top also holds a Wild and a Scatter. The Wild comes in the shape of a Clown (differing from the base symbol Clown) the Wild can act as a replacement for any symbol other than the Scatter, providing players with a better chance at a winning payline. The Monkey in question is the in-game Scatter and pays 2, 10 or 50 coins for 3, 4 or 5 in on a reel. All wins linked to a Scatter added to payline wins and then multiplied by the staked amount of credits. Unlike in many games, the Scatter does not trigger a Free Spin round but wins can still be made from these cheeky Monkeys without finding them in a single payline. A game filled with whimsy and imagination, Big Top acts as the perfect transition machine from land-based fruit machines to the online community. The rules are standard with any video slot with the additional payouts coming from the Wild. Despite the Scatter not holding its typical Free Spin bonus the act of them winning without being in a single line still allows them to pass as an impressive bonus feature. If you love Big Top then you'll also love Retro Super 80s. Why not give it a go.